Schofield Barracks is located in Honolulu, Hawaii and is home to the Army's 25th Infantry Division, known as the Tropic Lightning Division. The 25th Infantry Division conducts military operations in the Asia-Pacific region using Strykers, light infantry, airborne and aviation units flying the AH-64 Apache. 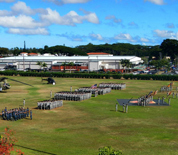 The Command Headquarters for United States Army Hawaii and the 8th Theater Sustainment Command are also located at Schofield. The 25th Infantry Division Memorial, a four piece statue, can be found on the base property. This Schofield Barracks directory features the critical info you’ll need to navigate through the many facilities and recreational opportunities available on base.